Advances in treatments for Hodgkin Lymphoma (HL) have significantly increased survival of childhood and adult patients; however, the leading cause of death in HL survivors is due to secondary malignancy following HL treatment [1,2]. Among women treated for HL, breast cancer (BC) is the most common secondary malignancy . We explored if an association exists between HL and BC exists within families. Utilizing the Utah Population Database and the Utah Cancer Registry, we identified 988 women with HL, and no history of BC prior to HL, diagnosed in Utah from 1966-2014. We examined if women with HL were at greater risk of developing BC based on the presence or absence of family history of BC. We also examined the familial recurrence risk of BC among female FDRs of women with HL and BC using Cox regression methods. Among 988 female HL patients, 42 (4.3%) were diagnosed with subsequent BC while among 9,876 matched controls, 280 controls (2.8%) were diagnosed with BC from 1966-2014 (P < 0.05). We observed a significant 3-fold increased risk of BC in the first-degree relatives (parent, full sibling, or child of patient) of female HL patients with subsequent BC, compared to FDR in controls (HR = 2.8, 95%CI 1.4-5.6; P = 0.005). Female HL patients who had a family history of BC were significantly more likely to develop BC, compared to HL patients with no history of BC among relatives (HR = 3.3, 95%CI 1.6-7.1; P = 0.002). Women with HL and a family history of BC are at even higher than anticipated risk of BC, as are their female relatives. Obtaining a thorough family history for a woman preparing to undergo therapy for HL is important for treatment decisions for HL and maintaining an up to date family history over time is also important for the management of a woman's ongoing cancer risks and her surveillance strategy following survival of HL. Due to advances in treatments for Hodgkin Lymphoma (HL) significantly more children and adults now survive following their initial diagnosis [1,2]; however, the leading cause of death in HL survivors is a secondary malignancy potentially related to HL treatments . Among women treated for HL, breast cancer (BC) is the most common type of secondary malignancy, particularly those who received supradiaphragmatic radiation therapy [3,4]. The cumulative risk of BC over the 30 years following treatment for HL approaches 40%, which is influenced by factors such as the woman's age at the time of treatment, the dose of radiation, size of radiotherapy field, and chemotherapy type [5-7]. The younger the patient's age at HL treatment, the higher the radiation dose and the use of alkylating chemotherapy are all positively associated with an increased risk of BC [8,9]. The treatment of HL has evolved and improved greatly over time. Initially treated solely with radiation, the first successful chemotherapy regimen for HL was MOPP (mechlorethamine, vincristine, procarbazine, prednisone), developed in the 1960's . Over the next few decades, other combinations were developed and refined into the standard protocols currently in use; these generally include at minimum an anthracycline, alkylator, bleomycin, a corticosteroid, and a vinca alkaloid . Patients with favorable risk and good response to chemotherapy often avoid radiation, while patients with high risk features or poor response to chemotherapy continue to be offered radiation therapy . A small number of patients are still treated with radiation alone, usually based on their histologic subtype and inability to receive chemotherapy . Radiation oncologists, when possible, have offered less radiation to women since 2000 because of the recognition of markedly increased risk of subsequent BC; however, fewer women receiving mantle radiation has not decreased the BC incidence among HL survivors as expected . The reason for the lack of reduction remains unclear, but may be related to fewer women undergoing premature menopause because of less gonado-toxic chemotherapy regimens or to lead time bias because of improved BC screening methodology . Early breast cancer screening and chemoprevention is routinely only recommended to those women exposed to chest radiotherapy . Clinical breast exams, annual mammogram, annual breast MRI and consideration of chemoprevention are now recommended to HL survivors because of the persistent and increased BC risk following HL treatment . BC that occurs among HL survivors is clinically distinct from sporadic breast cancer in multiple ways ; diagnosis at a median age of 42-years-old (compared to 61-years-old for sporadic BC) and earlier clinical stage at diagnosis (likely due to being identified by screening) . Treatment options are more limited in HL-related BC since lumpectomy with radiation is often not an option and chemotherapy choices may be limited since women may have previously been exposed to alkylating chemotherapy [6,14]. Several attempts have been made to understand the underlying factors that predispose women disproportionately to secondary BC following HL treatment [18-20]. A genome-wide association study performed among HL survivors, contrasting between those who did and did not develop a second malignancy, suggested that variants at 6q21 were associated with increased risk for secondary malignancy following radiation for HL [7,21]. A family history of BC among first degree relatives (FDR; parent, full sibling, or child) has been correlated with metachronous contralateral BC among HL survivors when compared to sporadic BC [19,22]. An increased incidence of contralateral BC has been reported among patients previously treated for BC who also had been previously treated for HL compared to those who had contralateral BC without a prior HL diagnosis . As HL is a relatively rare diagnosis and secondary BC is typically associated with a longer latency, at risk populations and healthcare providers should understand the increased risk for BC in HL survivors in order to offer personalized screening and risk reduction options [18,23-25]. Using a large, genealogical database linked to statewide cancer records, we investigated families of women who developed BC following a diagnosis of HL to determine if family history of breast cancer could be predictive of risk for BC in HL survivors. This study takes advantage of two interlinked population data resources, the Utah Population Database (UPDB) and the Utah Cancer Registry (UCR). The UPDB is a research resource housed at the University of Utah that contains computerized data records for over 9 million individuals who have lived in Utah or currently reside in the state . As previously described , the UPDB was created in the 1970's from genealogic data of pioneer founders and their descendants (1.63 million individuals born from the early-1800's to mid-1900's) . Established in 1966, the UCR is a statewide registry with near complete ascertainment of cancers diagnosed in Utah and since 1973 has been part of the Surveillance, Epidemiology, and End Results (SEER) network of the National Cancer Institute (NCI) registries. State law requires that all primary cancers diagnosed in Utah be reported to the UCR. These data, available for approved research purposes, are updated routinely and probabilistic record-linking is performed with individuals in the UPDB . Due to its large size and the varied sources of its information, most families living in the state of Utah are represented . For example, 84% of all individuals born in Utah in 1950 have grandparent information and 67% have five or more previous generations documented in the UPDB. As such, the UPDB is the only database of its kind in the U.S., and one of only a few in the world, that can permit such analyses as performed in this study. We identified 988 women with primary HL (and no prior history of BC) diagnosed in Utah from 1966-2014 who linked to pedigree information (Figure 1). All subsequent diagnoses of primary BC tumors among these patients were gathered, and 42 women with secondary BC were identified. Probands with a diagnosis of BC in 1994 or later were cross referenced with genetic testing records from the University of Utah, the predominant provider of genetic services in the state during the timeframe of the study, and no carriers of a pathogenic BRCA variant were identified. Diagnosis details, including date of HL diagnosis, date of BC diagnosis, and receipt of radiation for HL, BC diagnoses, cancer stage, estrogen receptor (ER), progesterone receptor (PR), and HER2 status were obtained. For all women with HL and for matched controls, BC diagnoses among their FDR's were identified as shown in Figure 1. 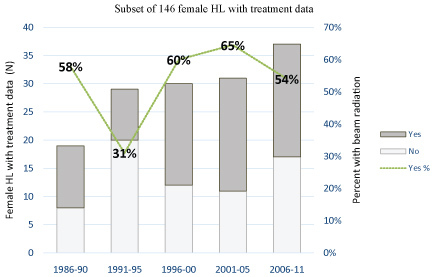 Figure 1: Proportion of women receiving radiation in a subset of 146 female HL patients with treatment data available by five-year intervals of diagnosis year (1986-2011). Using the UPDB, random female controls with no history of HL who had familial pedigree information were selected and individually matched on birth year to women with HL in a 10:1 target ratio. In order to be included, control probands were required to have follow up information in UPDB for at least as long as the follow-up period of their respective matched case (Figure 1). As previously described [29,30], software developed at the University of Utah specifically for the UPDB and in conjunction with the software package R (R version 3.0.2 for Linux OS, Vienna, Austria) was used to estimate the magnitude of familial recurrence risk in relatives, as determined from a Cox regression hazard rate ratio. FDR's who were alive on January 1, 1966 with follow up in Utah (including mothers, full sisters, and children) were determined from UPDB genealogy information for cases and controls. We examined if HL probands were at greater risk of developing BC based on the presence or absence of a first-degree family history of BC compared to risk of BC in their corresponding age-matched controls, and In a case by case comparison we examined BC risk in HL probands with or without family history of BC adjusted for age at HL diagnosis. We also examined the familial recurrence risk of BC among female FDRs of women with HL and a subsequent BC diagnosis compared to the familial recurrence risk of BC among female FDR of age-matched 10:1 population controls, adjusting for race/ethnicity and FDR birth year. Likewise, the familial recurrence risk of BC among relatives of women with HL and no personal history of BC was compared to relatives of their matched controls. All models included an adjustment for race and ethnicity. Women who died without a BC diagnosis or who were not diagnosed by December 31, 2014 were treated as right-censored. As observations within families are non-independent, the Huber-White sandwich estimator of variance for clustered data was used because it accounts for departures from standard statistical assumptions [29,31,32]. This analysis corrects for any families that were analyzed multiple times because of multiple women with BC within the family. The characteristics of HL patients, shown separately for those with a subsequent BC diagnosis and those with no BC, and of their corresponding matched controls are shown in Table 1. Overall, among 988 female HL patients, 42 (4.3%) were diagnosed with a subsequent BC while among 9,876 controls matched to HL patients, 280 controls (2.8%) were diagnosed with BC during the study period (1966-2014). Both case and control probands were predominantly non-Hispanic white women, reflecting the overall characteristics of the Utah population (Table 1). Women with HL subsequently diagnosed with BC were more likely to have at least one FDR diagnosed with BC (10 of 42 patients, 23.8%) compared to women with HL and no subsequent BC (55 of 946 patients, 5.8%; P < 0.001). In the associated controls of women with HL who developed BC, 36 controls (8.6%) had at least one FDR with BC (P = 0.005). In contrast, women with HL but no subsequent BC were no more likely to have at least one FDR with BC than were their respective matched controls (5.8% and 6.2%, respectively; P = 0.72). The total number of female FDR of HL patients and their associated population controls are shown in Table 1. Among HL patients with subsequent BC, their close female relatives were more likely to also have a BC diagnosis (8.6%) than were FDR of HL patients with no BC (2.4%) or compared to the FDR of controls matched to HL patients with and without BC (3.0% and 2.5%, respectively). The 'baseline' risk in Utah of BC among FDR of BC patients is 1.8-fold (P < 0.0001) compared to women with no FDR family history of BC (Table 2). Importantly, women diagnosed with HL had a markedly higher BC risk if they also had a history of BC in FDR compared to controls (HR = 3.8, 95%CI 1.9-7.7; P < 0.0001), more than double that of baseline, or that of BC risk in HL patients with no FDR history of BC (HR = 1.7, 95%CI 1.2-2.5; P = 0.002). In a case-case comparison, female HL patients who had a FDR history of BC were significantly more likely to develop BC themselves compared to HL patients with no history of BC in FDR (HR = 3.3, 95%CI 1.6-7.1; P = 0.002; see Table 2). We observed a significant and nearly 3-fold increased risk  of BC in the FDR of female HL patients who had a subsequent BC, compared to FDR of their corresponding controls (HR = 2.8, 95%CI 1.4-5.6; P = 0.004; Table 2). The majority of HL patients who developed BC were diagnosed with HL before year 2000 (40 of 42 cases), and thus at high likelihood of radiation exposure [18,19]. Sixty-one percent of women with BC after HL were 30 or younger at the time of HL diagnosis, with a median age of 25 years. Most BC was diagnosed at a relatively young age, by 48 years of age, with a median time of 37 years between HL and BC diagnoses (Table 1). Our study included a lengthy follow up time for most women, Among 988 HL patients, a subset of 146 women (15%) had information available from linked medical records in 1986-2011 related to radiation treatment (Figure 2). Of these 146 women, 78 (53%) had radiation treatment while 68 (47%) did not undergo radiation. In our limited subset, only 4 female HL patients who developed BC had treatment data, documenting only one who had radiation. Therefore, we were unable to assess differences in treatment exposure between HL patients who had BC and those who did not. Based on these data (unavailable prior to 1986) we believe that approximately half of women diagnosed with HL in our study were likely to have received radiation treatment . Diagnostic records of breast cancers observed in HL cases and controls and in their female FDR's were available for 15 HL patients, 69 non-HL control patients, 18 FDR of case patients and 132 FDR of control patients (Supplemental Table S1). These data include estrogen receptor (ER), progesterone receptor (PR), and human epidermal growth factor receptor 2 (HER2) status. In our BC historic cohort, the tumor marker data often indicate a tumor receptor status of unknown result or unassessed, however, when available, the tumor subtype data is consistent in BC among HL cases and controls as well as among their FDR. The majority of BCs for all groups were ER/PR positive, and when HER2 was available, the majority subtype was ER+/PR+/HER2-, similar to that reported in other predominantly Caucasian populations . The unique resource of the UPDB provides a novel perspective into the familial recurrence risks of BC among female HL survivors. We observed that if a female HL patient has one or more FDR's with a history of BC, that patient is at a two times higher risk of subsequent BC than a HL patient without a family history of BC in her FDR's, although confidence intervals somewhat overlap. Our results lend further support to findings of Morton, et al. , that genetic factors modify a woman's risk of BC after treatment for HL. Researchers using the Swedish Family-Cancer Project Database recently reported similar findings to ours, that women with HL and a FDR history of BC were at increased risk of BC compared to women with HL and no BC family history . Because of available treatment records, we were able to estimate the proportion of HL patients receiving radiation treatment based on an analysis of a subset of patients linked to detailed treatment records and found no observable decline in the proportion of women receiving radiation over the study period. Our current study also includes a description of the BC subtypes available for a small subset of patients; interestingly, these data do not suggest that any particular BC subtype is more common among HL survivors than among women with sporadic BC, although this requires further examination with a larger subtype dataset. This study is limited by the lack of specific doses of radiation and details of the drugs that were delivered in chemotherapy regimens administered to HL patients, since these factors can influence BC risk. Most people in our study were non-Hispanic whites, representative of the Utah population and of other U.S. states or population groups comprised mostly of Caucasians of northern European descent. 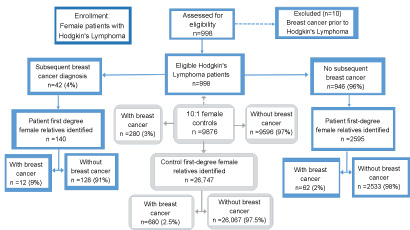 Although only limited information exists about the association between breast cancer and hogkin's lymphoma in families with a notable history of breast cancer, these findings have implications for clinical practice, both when considering the optimal treatment regimen for a woman newly diagnosed with HL and for the ongoing surveillance for survivors of childhood HL. Enhanced breast cancer screening and risk reducing strategies should be considered for women with HL who have a family history of BC regardless of whether treatment included radiation. Our analysis also highlights the importance of a BC diagnosis after HL for unaffected family members. The BC risk for female family members may have been previously discounted during risk assessment because the HL associated BC was attributed solely to effects of HL treatment. A careful family history may reveal an unknown genetic risk for BC in the families of patients with HL, and also help to personalize the treatment plan for individual patients. The authors whose names are listed certify that they have no affiliations with or involvement in any organization or entity with any financial interest (such as honoraria; educational grants; participation in speakers' bureaus; membership, employment, consultancies, stock ownership, or other equity. Approval to conduct this study was received from the University of Utah Institutional Review Board (IRB 00037056) and the Resource for Genetic Epidemiologic Research, the body that governs the use of UPDB data. A waiver of consent was obtained as this retrospective records-based, non-contact study posed minimal risk to study participants. This study was supported in part by National Institutes of Health National Cancer Institute (P30CA042014) to the Huntsman Cancer Institute, Genetic Counseling, and Utah Population Database shared resources; the Huntsman Cancer Foundation, for its support of the Pedigree and Population Resource for the ongoing collection, maintenance and support of the Utah Population Database; the Utah Cancer Registry, funded by contract HHSN261201000026C from NCI's SEER Program with additional support from the Utah State Department of Health and the University of Utah. Dr. Schiffman was supported by the Edward B. Clark, MD Chair in Pediatric Research and the Primary Children's Hospital (PCH) Pediatric Cancer Research Program, funded by the Intermountain Healthcare Foundation and PCH Foundation. The content is solely the responsibility of the authors and does not necessarily represent the official views of the National Institutes of Health. Smith MA, Altekruse SF, Adamson PC, Reaman GH, Seibel NL (2014) Declining childhood and adolescent cancer mortality. Cancer 120: 2497-2506. Aleman BM, van den Belt-Dusebout AW, Klokman WJ, Van't Veer MB, Bartelink H, et al. (2003) Long-term cause-specific mortality of patients treated for Hodgkin's disease. J Clin Oncol 21: 3431-3439. Bhatia S, Robison LL, Oberlin O, Greenberg M, Bunin G, et al. (1996) Breast cancer and other second neoplasms after childhood Hodgkin's disease. N Engl J Med 334: 745-751. 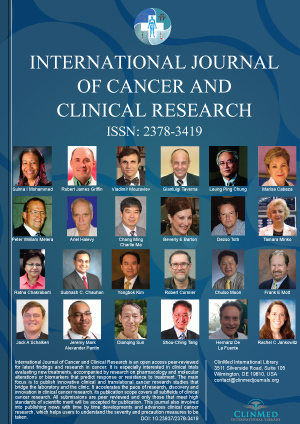 Moskowitz CS, Chou JF, Wolden SL, Jonine LB, Jyoti Malhotra, et al. (2014) Breast Cancer after Chest Radiation Therapy for Childhood Cancer. J Clin Oncol 32: 2217-2223. Travis LB, Hill D, Dores GM, Gospodarowicz M, van Leeuwen FE, et al. (2005) Cumulative absolute breast cancer risk for young women treated for Hodgkin lymphoma. J Natl Cancer Inst 97: 1428-1437. Elkin EB, Klem ML, Gonzales AM, Ishill NM, Hodgson D, et al. (2011) Characteristics and outcomes of breast cancer in women with and without a history of radiation for Hodgkin's lymphoma: a multi-institutional, matched cohort study. J Clin Oncol 29: 2466-2473. Schaapveld M, Aleman BM, van Eggermond AM, Janus CP, Krol AD, et al. (2015) Second Cancer Risk Up to 40 Years after Treatment for Hodgkin's Lymphoma. N Engl J Med 373: 2499-2511. Travis LB, Hill DA, Dores GM, Gospodarowicz M, van Leeuwen FE, et al. (2003) Breast cancer following radiotherapy and chemotherapy among young women with Hodgkin disease. JAMA 290: 465-475. De Bruin ML, Sparidans J, van't Veer MB, Noordijk EM, Louwman MW, et al. (2009) Breast cancer risk in female survivors of Hodgkin's lymphoma: lower risk after smaller radiation volumes. J Clin Oncol 27: 4239-4246. Frei E III, Devita, VT, Moxley, J.H. III Carbone PP (1966) Approaches to improving the chemotherapy of Hodgkin's disease. Cancer Res 26: 1284-1289. Bonadonna G, Zucali R, Monfardini S, De Lena M, Uslenghi C (1975) Combination chemotherapy of Hodgkin's disease with adriamycin, bleomycin, vinblastine and imidazole carboxamide versus MOPP. Cancer 36: 252-259. Evens AM, Helenowski I, Ramsdale E, Nabhan C, Karmali R, et al. (2012) A retrospective multicenter analysis of elderly Hodgkin lymphoma: outcomes and prognostic factors in the modern era. Blood 119: 692-695. Specht L, Yahalom J, Illidge T, Berthelsen AK, Constine LS, et al. (2014) Modern Radiation Therapy for Hodgkin Lymphoma: Field and Dose Guidelines from the International Lymphoma Radiation Oncology Group (ILROG). Int J Radiation Oncol Biol Phys 89: 854-862. Wood ME, Vogel V, Ng A, Foxhall L, Goodwin P, et al. (2012) Second malignant neoplasms: assessment and strategies for risk reduction. J Clin Oncol 30: 3734-3745. Andrea Ng, van Leeuwen (2016) Hodgkin lymphoma: Late effects of treatment and guidelines for surveillance. Semin Hematol 53: 209-215. Henderson TO, Amsterdam A, Bhatia S, Hudson MM, Meadows AT, et al. (2010) Systematic review: surveillance for breast cancer in women treated with chest radiation for childhood, adolescent, or young adult cancer. Ann Intern Med 152: 444-455. Sanna G, Lorizzo K, Rotmensz N, Bagnardi V, Cinieri S, et al. (2007) Breast cancer in Hodgkin's disease and non-Hodgkin's lymphoma survivors. Ann Oncol 18: 288-292. Overbeek A, van den Berg MH, van Leeuwen FE, Kaspers GJ, Lambalk CB, et al. (2017) Chemotherapy-related late adverse effects on ovarian function in female survivors of childhood and young adult cancer: A systematic review. Cancer Treat Rev 53: 10-24. Crump M, Hodgson D (2009) Secondary breast cancer in Hodgkin's lymphoma survivors. J Clin Oncol 27: 4229-4231. Curtis R, Boice J (1988) Second cancers after radiotherapy for Hodgkin's disease. N Engl J Med 319: 244-246. Best T, Li D, Skol AD, Kirchhoff T, Jackson SA, et al. (2011) Variants at 6q21 implicate PRDM1 in the etiology of therapy-induced second malignancies after Hodgkin lymphoma. Nat Med 17: 941-943. Gaffney DK, Hemmersmeier J, Holden J, Marshall J, Smith LM, et al. (2001) Breast cancer after mantle irradiation for Hodgkin's disease: correlation of clinical, pathologic, and molecular features including loss of heterozygosity at BRCA1 and BRCA2. Int J Radiat Oncol Biol Phys 49: 539-546. Jorde LB (1989) Inbreeding in the Utah Mormons: an evaluation of estimates based on pedigrees, isonymy, and migration matrices. Ann Hum Genet 53: 339-355. Meadows AT, Friedman DL, Neglia JP, Mertens AC, Donaldson SS, et al. (2009) Second neoplasms in survivors of childhood cancer: findings from the Childhood Cancer Survivor Study cohort. J Clin Oncol 27: 2356-2362. Ng AK, Bernardo MV, Weller E, Backstrand K, Silver B, et al. (2002) Second malignancy after Hodgkin disease treated with radiation therapy with or without chemotherapy: long-term risks and risk factors. Blood 100: 1989-1996. Feldkamp ML, Carey JC, Pimentel R, Krikov S, Botto LD (2011) Is gastroschisis truly a sporadic defect? : familial cases of gastroschisis in Utah, 1997 to 2008. Birth Defects Res A Clin Mol Teratol 91: 873-878. Prahalad S, O'brien E, Fraser AM, Kerber RA, Mineau GP, et al. (2004) Familial aggregation of juvenile idiopathic arthritis. Arthritis Rheum 50: 4022-4027. Kerber RA, O'Brien E (2005) A cohort study of cancer risk in relation to family histories of cancer in the Utah population database. Cancer 103: 1906-1915. Samadder NJ, Curtin K, Tuohy TM, Rowe KG, Mineau GP, et al. (2014) Increased risk of colorectal neoplasia among family members of patients with colorectal cancer: a population-based study in Utah. Gastroenterology 147: 814.e5-821.e5. Barbaro PM, Johnston K, Dalla-Pozza L, Cohn RJ, Wang YA, et al. (2011) Reduced incidence of second solid tumors in survivors of childhood Hodgkin's lymphoma treated without radiation therapy. Ann Oncol 22: 2569-2574. Sadler C, Goldfarb M (2015) Comparison of primary and secondary breast cancers in adolescents and young adults. Cancer 121: 1295-1302. Clemons M, Loijens L, Goss P (2000) Breast cancer risk following irradiation for Hodgkin's disease. Cancer Treat Rev 26: 291-302. Dores GM, Metayer C, Curtis RE, Lynch CF, Clarke EA, et al. (2002) Second malignant neoplasms among long-term survivors of Hodgkin's disease: a population-based evaluation over 25 years. J Clinic Oncol 20: 3484-3494. Morton LM, Sampson JN, Armstrong GT, Chen TH, Hudson MM, et al. (2017) Genome-Wide Association Study to Identify Susceptibility Loci That Modify Radiation-Related Risk for Breast Cancer After Childhood Cancer. J Natl Cancer Inst 109. Amit Sud, Hauke Thomsen, Kristina Sundquist, Richard S. Houlston, Kari Hemminki (2017) Risk of Second Cancer in Hodgkin Lymphoma Survivors and Influence of Family History. J Clin Oncol 35: 1584-1590. Eric Johnson, MD, Department of Internal Medicine, University of Utah School of Medicine, 30 N 1900 E, Salt Lake City, Utah 84132, USA, Tel: 1-801-581-7606. © 2019 Colonna S, et al. This is an open-access article distributed under the terms of the Creative Commons Attribution License, which permits unrestricted use, distribution, and reproduction in any medium, provided the original author and source are credited.